The Menu Bar pull downs are no longer supported in MicroStation CONNECT. Many organizations created custom pull downs for organizing workflows, hard to find tools, and custom macros/mdl’s. These can be easily added as ribbon selections. Prior to configuring MicroStation CONNECT to find your custom GUI DGNlib, open it in the MicroStation V8i (SELECTseries) Workspace > Customize dialog and copy your custom Menu Bar to either a Toolbox or User Task. Once that is done you can then copy your GUI DGNlib to MicroStation CONNECT, then configure your custom toolboxes and menus to show up in the ribbon. 1. Open your GUI DGNlib file in MicroStation CONNECT. 2. Select File > Settings > Configuration > Customize. 3. 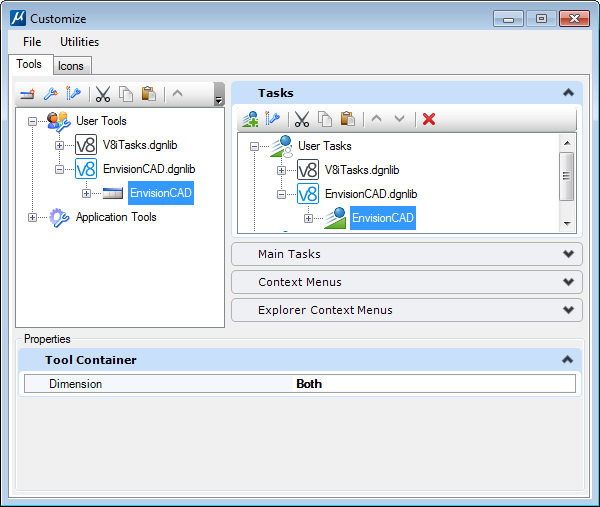 In the Customize dialog, copy your custom toolbox to a User Task if it is not already there. 4. Close the Customize dialog. 5. In the Active Workflow drop down, select Task Navigation. 6. In the Task Selection drop down, select your custom task menu.